Eliezer Santiago received a word from the Lord about judgement that is coming by water. In the word that was given to him, the hand of the Lord touches the ocean, and waves come inland. This matches up with so many of the other tsunami dreams and visions we have heard before, which can be seen at the bottom of this post. 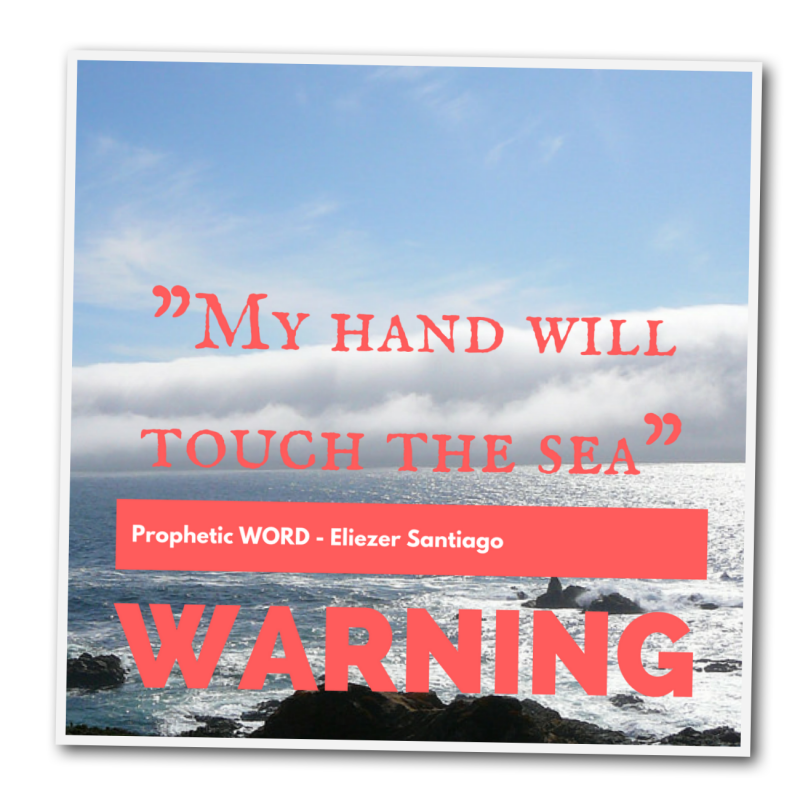 What is interesting about this prophetic word is the mention of Gods hand touching the ocean, which causes waves to come inland. What I have been discovering is there are a lot of people who have also seen a meteor or an asteroid hit the ocean. Most people are often given parts of an event, rather than the whole picture. Are Astronomers Admitting Planet X Exists?- Planet X Links – Why God? My wife, children and I live in Manhattan, NYC. We are born-again Christians and God spoke to my wife, two sisters in Christ and me in Spiritual Tongues and interpretation of Tongues while we were praying in a vigil on Saturday, September 5, 2015 at about 2:30 AM. God spoke to us and HE commanded me to proclaim HIS Ultimatum. God even confirmed the message that HE gave me 3 days later through a Pastor/Evangelist that came from Central America to preach in NYC. I had never seen that man and he confirmed the message and confirmed God’s commandment for me to warn everyone. Ever since, I have given this message in different ways. First, I preached this Judgment in different Churches. I warned my pastor, the Bishop (President of the Latin-American Council), and many others Pastors and world leaders from different denominations. Furthermore, I have written many letters (hundreds) and sent them to the respective churches. Also, God opened doors at a radio station named “Radiovision Cristiana”. This is the biggest Hispanic radio station in the world and their audience’s numbers are in the millions. I also used the media (Facebook, YouTube, WhatsUp) to spread God’s words. This message reached many people of different countries of the world. I am not giving this information to boast, for I am nothing without HIM. I am just an unworthy servant of the Most-High. In fact, I never thought that God would use me this way! I am just glad that the message reached as far as it did for the sake of the souls. We have been preparing with food, water, emergencies supplies, and hunting courses for survival. God already spoke to my wife and me and gave us instructions to move In-land (Appalachian Mountains) and what TO DO and what NOT TO DO while we are there. God already told us that he has a task for us to do after this judgment. God is preparing us now, just as I write this letter, to get us ready for the time of affliction. We are just waiting for HIM to give us the command (LEAVE NOW). Please feel free to posted online, however you deem appropriate. Feel free to contact me as well. God bless you and thank again for replying. During a vigil inside an apartment in a building of Wagner Housing, East Harlem, Manhattan, 10035 (New York City). WOE! WOE! WOE! I will astonish at early morning! There is a WOE coming to this earth! Judgment is coming to this earth! The earth will shake and tremble. My hand will touch the sea. My hand will raise the waves and the waves come ashore. It will come and will come, the water will come. I have been talking to My people and they do not want to believe; they do not want to hear! The world is getting prepared, but My Church is not. The powerful and are hiding in the mountains. They believe they will escape my wrath but I will bring them down from there! It is written in My Word and they do not want to believe. Read, it is written! Open your eyes, look at around you! They forget that Satan is already making his moves and the Church is still on earth. My church is asleep! The time is over and the bride is still not clean: unstained and unwrinkled. To that which is evil they call good, and to that which is good they call evil. Many believe that they can fool Me and hide from Me, but I am Jehovah and I examine the hearts. WOE to those pastors who knowing Me and My Word, deceive My sheep! There is Judgment coming against these pastors! I’ll open the earth and the earth is going to swallow them, for they have twisted My Word. My Church does not want to get purified, then I’m going to purify her! I am the Jehovah and I have everything under control. You are forgetting that I have everything under control. Fear not, I will protect those that are faithful. I will take care of my people. I decide which building falls and which building will remain standing. I will warn and will wake up on that early morning. Church you must prepare and stock, but most importantly get prepared spiritually. Get right with Me. Many will die. Pain, pests, diseases, destruction and darkness is coming to earth as never before. You shall help your neighbor and WHOE to those who do not help their neighbor, when they have the ability to do so. Continue clamoring for mercy. The judgment will come, but I will have mercy on those whom I will have mercy. Be aware. Look at around, because I will continue to speak through the sky, land and around you. I have risen my servants to carry this message to all over the world. And when this happens, no one will be able to deny that I Jehovah brought this judgment upon the earth. After this judgment, shortly after I will pick up my Church. Never forget that I love you. It pains me to do this but I have to because I love you. Be strong. Go and tell My people the message I have given you today. Go and tell My people that Jehovah has commanded you. Go and hurry! But I command to hurry up! Go and tell them that Jehovah has commanded you! And if they do not want to believe, tell them to ask me. If you they not believe, do not debate with them. Get up and alert the following person. I’ll take care of them. Tell them that this will happen VEEERYY soon. THE JUDGMENT WILL COME FIRST, AND THEN I WILL COME TO RISE MY CHURCH..
1, 2, 3, AND THAT QUICKLY I WILL PICK UP MY CHURCH! Beloved in the Lord, behold, I have complied with the order that God gave me. This judgment is imminent. I’ve been delivering this message of alert to different churches, pastors and leaders of different Councils in New York City and elsewhere in the world. This message was already delivered in my church The Synagogue and God confirmed it twice on the same day that this message was delivered to the Church. In addition, I personally spoke with Bishop and Reverend Santos Roman via phone to warn him about the Judgment of God. After praying and seeking confirmation about this message, the Bishop Reverend Santos Roman gave me permission to bring this message to the people and leadership of the Latin American Council. This message was delivered on Saturday 05/12/15 day to the Latin American Council at the monthly meeting that took place in The Synagogue. All the executive body, pastors, leaders and many other representatives from around the world who were present received this message from God. Additionally, this message that God has given me for His people has reached several countries such as Israel, Indonesia, Romania, Africa, Chile, Argentina, Venezuela, Colombia, El Salvador, Mexico, Spain, the Caribbean, United States and many other nations. Finally, God opened the doors at the renowned radio station Radio Vision Cristiana. To the glory of God, I preached this message on Radio Vision Cristiana Wednesday, December 30, 2015. This warning of God reached millions of listeners. I am aware that the nature of this message is very strong. I beg you to pray, clamor, fast, and vigil so the Holy Spirit can confirm these words that I have placed on your hands. This warning of judgment from the Lord is already on your hands. Every pastor, leader, layman is responsible for notifying the people and the world of what lies ahead. God is calling to His leaders to warn and prepare His people not only spiritually, but also to stock food, water, medical supplies and basic-need items. The scriptures speak about a similar preparation in the story of Joseph of Egypt. As Jehovah’s watchman I am doing-and I will continue to adhere- to my part. God has been opening doors and will continue to open doors. Many people have come to the feet of Christ after hearing this message. They have straightened and given their lives to our Creator. I have faith and hope that you, dear brothers in the faith, will enlist in this mission and help me promulgate this message of warning from God. I pray to God that we all be found worthy to receive the covenant of protection that God has promised to those who are faithful. I invite you emphatically to contact me or my pastor as you wish. I speak this word from God and I am responsible for what I say. My information is displayed on the top and bottom of this letter. I urge you to enact this message very quickly. I urge to alert people about the end of times we are living now. I urge you to store water, food, medicine and basic-need items. I ask earnestly and respectfully not to change, remove, or add to what God spoke. The words that I wrote was the exact and straight-forward words of God. Therefore, we must preserve this message exactly as God said it. Apr 14, 2015 – New Madrid Fault Line, California, West Coast Fall Into The Sea – ” The first thing I saw was America split in two, just right down the middle. Aug 28, 2015 – Nile Milton I had a Tsunami dream before I left California back in 2009. ….. I heard someone say water is coming from the east get on sea level .